We regret to inform you of the death of Earlene J. Phillips, Grandmother of Cpl. Brooks A. Phillips on April 23, 2016. Our thoughts and prayers are with the Phillips family at this difficult time. The following obituary information has been reprinted from the Daily Times and condolences can be left on the Short Funeral Home website. 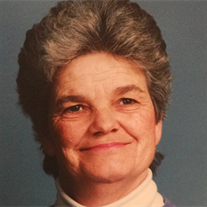 SNOW HILL- Earlene J. Phillips, 75, of Snow Hill, passed away Saturday, April 23, 2016 at her home, surrounded by her loving family. She was born June 18, 1940 in Salisbury, a daughter of the late Thomas J. Stevenson, Sr. and Mollie Bounds Stevenson. Earlene was a long time, active member of Bates Memorial United Methodist Church and a 45 year member of the Snow Hill Fire Co. Ladies Auxiliary. She was a wonderful homemaker and will be remembered as a proud wife, mother, grandmother and great grandmother. In her younger days she liked camping and trips to the beach, working in her flowers and was a wonderful cook. She loved family get-togethers and made Christmases and birthdays special for her family. She was an avid lover of all dogs and a collector of teddy bears. She is survived by her husband of 58 years, James “Jim” M. Phillips; children, Glen Phillips and wife, Barbara and Bruce Phillips and wife, Shannon, all of Snow Hill; grandchildren, Brooks and wife, Carrie, Brian and wife, Julie, Chase and Erin; and a great grandson, Caden. She is also survived by sisters, Doris Santerella of Boston, Alta Wood of Florida and Hattie Shanks of Salisbury; and several nieces and nephews. In addition to her parents, she was preceded in death by brothers, William, Vernon, Ota, Clyde, Morris, Marion and Thomas, Jr.; and sisters, Helen and Dorothy. The family would like to thank the doctors and nurses of PRMC and Coastal Hospice for their tender and loving care throughout Mrs. Phillips’ illness. A funeral service will be held on Wednesday, April 27, 2016 at 1:00 p.m. at Bates Memorial United Methodist Church in Snow Hill, where family and friends may call from 12:00 to 1:00. Pastor Joe Barth will officiate. Interment will follow the services at Mt. Olivet Cemetery. Following the interment family and friends are invited to Snow Hill Fire Department for a time of food and fellowship. In lieu of flowers, memorial contributions may be made in her memory to Snow Hill Volunteer Fire Co., P.O. Box 83, Snow Hill, MD 21863 or Bates Memorial United Methodist Church, c/o Debra Hambrick, 402 S. Morris Street, Snow Hill, MD 21863. Arrangements are in the care of Short Funeral Home in Delmar. Online condolences may be sent to the family by visiting www.shortfh.com.